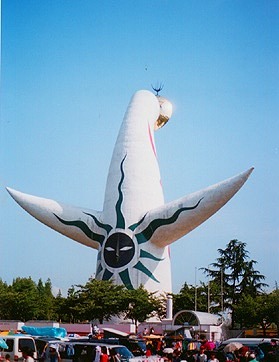 The Tower of the Sun was is an artwork created by Japanese artist Tarō Okamoto and constructed for the Osaka World Exposition of 1970, and housed in a building called "Big Roof" designed by Kenzo Tange, a Japanese architect. The tip of the tower projected out of the Big Roof's ceiling due to the height of the building. Construction began in 1969. The Front Face of the Sun measured twelve meters in diameter and was attached to the middle of the tower on 30 September. The Golden Mask of the Sun was mounted on the top of the tower, 65 meters above the ground. The installation ceremony for the Golden Mask was followed by the splitting of the Kusu-dama (large ball) from which doves and balloons burst out into the autumnal sky, while two giant cranes lifted the mask up onto its stand slowly and carefully. Soon afterwards, the Black Face was installed, looking towards the Festival Plaza. The Tree of Life was set inside the tower in November, and its painting completed on 21 February 1970. Models of living creatures, 292 altogether, ranging from amoeba through jellyfish to primitive man, were attached to the branches of the tree, many miniatures and objects created by the Tsuburaya Productions were suspended from the tree. 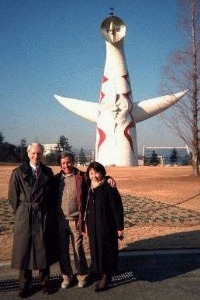 It was 45 metres high and represents the strength of the life heading to the future. Moving staircases surrounded the tree, and a lift enabled visitors to go to the upper floor. Open to the public during the expo, the Tower of the Sun was closed when the expo ended. The Big Roof housing the tower was removed in 1979, causing the tower to be exposed for a long time. The tower has gradually deteriorated. 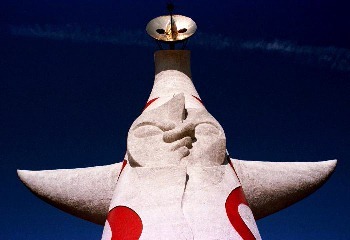 On October 11 and 12, 2003, the inside of the Tower of the Sun was opened to a selected 1,970 people (the figure was chosen for the year the expo was held). Because over 24,000 people applied for admission, the Commemorative Organization for the Japan World Exposition '70 decided to open the tower again in November and December of the same year. Openings occurred irregularly through October 2006, permitting more than 40,000 people to visit the inside of the tower. Due to repair and renovation for the 40th anniversary event of the Expo '70 in 2010, the tower is closed again. 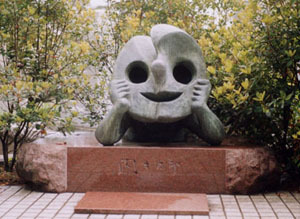 It is planned to be open to the public again during the event in 2010. Vidu ankaŭ mian paĝon pri Brand New Knife! 7 Julio 2000 de Ailanto kreita, 18 Marto 2018 modifita.